This is the first post in a new series on Mesocosm, presenting short commentaries on pictures of interesting artifacts or works of art. Over time I’ll draw links between recurring motifs or historical connections. This stele, displayed at the British Museum, depicts the Assyrian Tree of Life motif. These zigzaggy trees are typically flanked by a pair “winged genii,” often with animal heads and four wings, as in the vision of Ezekiel. Comparative religions scholars generally interpret the Tree of Life as a version of the axis mundi, a symbol that depicts the center of the cosmos. 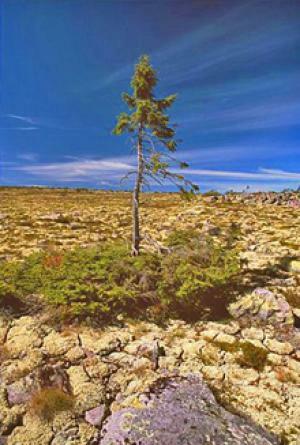 In an impressively diverse range of cultures, the higher mysteries reveal an identification of the tree at the center of the cosmos with the tree at the center of the self. The Buddha, for example, achieved enlightenment seated beneath the Tree of Enlightenment, at the vajra seat, an immovable pivot at the very center of the world. Our stele comes from the palace of Nimrud, an early capital of the Neo-Assyrian empire of the first millennium BCE. Located in the Fertile Crescent in present-day Iraq, the Assyrians ruled the epicenter of urban development where Sumer and the Babylonian empire had stood long before. The stele depicts twin images of King Ashurnasirpal II (ca. 883 B.C.–859 B.C. ), first great king of the Neo-Assyrians, on either side of the Tree, wearing ritual robes. And set up constellations, the patterns of the stars. And set up three stars each for the twelve months. Both Ashur and Marduk are associated with the celestial order, marked by the immutable circuits of the heavenly bodies, and likewise associated with the divine mandate to rule. 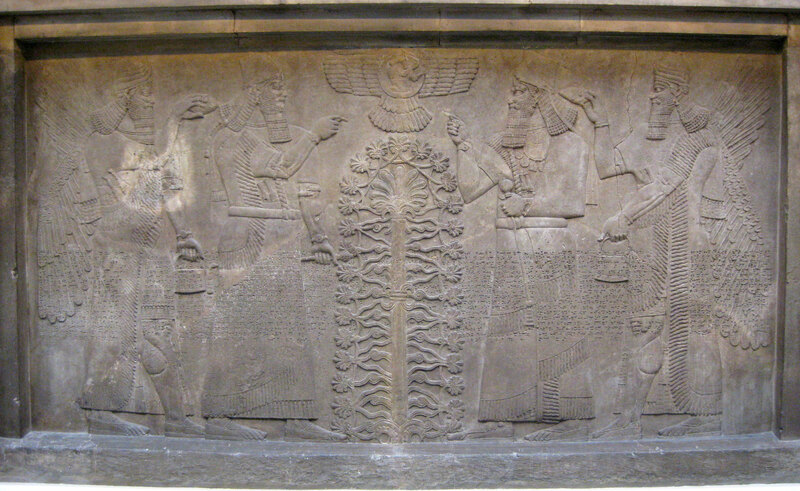 This stele proclaims the divine legitimacy of Ashurnasirpal II, who acts as custodian to the Tree of Life itself. These myths reflect the belief that force of arms confers the ruling mandate. There is no doubt that Ashurnasirpal II ruled through strength of arms. He is remembered as a cruel king, having boasted in his annals “Three thousand captives I burned with fire. Their corpses I formed into pillars.” (2) One wonders if he was thinking of Marduk, building the world from the body of Tiamat. Ashur’s predecessor Marduk was also prominently associated with an axis mundi image; specifically, the cosmic mountain, which is represented by the ziggurat temple structures of Babylon. The great ziggurat of Babylon itself, dedicated to Marduk, was called Etemenanki, meaning “Foundation of Heaven and Earth.” The cosmic mountain depicted by the ziggurat is roughly equivalent to the cosmic mountain described by Black Elk in his vision quoted above. The great holiday of the Babylonian empire was the Akitu festival which began on New Year’s Day. In this festival the god of the earth ascends to the summit of the holy mountain to join with the sky, in a ceremonial recapitulation of the story of creation. The Enuma elish creation saga was read aloud. On the tenth day of the festival, the king climbed to the top of the ziggurat. In ceremonial identification with Marduk, the king of the world celebrated a mystical marriage by joining in sexual union with the high priestess, in her identification with the celestial goddess Ishtar. In this way the order of the heavens made contact with the order of the earth, and the energy released by their union drove the wheel of creation around its axis for another cycle. (1) Niehard John C. Black Elk Speaks. University of Nebraska Press. 1961. pp 42-3. (2) Nardo, Don, et al. The Greenhaven Encyclopedia of Ancient Mesopotamia. Greenhaven Press. 2007. pg 39. (3) Enuma Elish. V. 1-6. http://www.ancient.eu.com/article/225/. Retrieved Dec 08, 2011. (4) H.D. Tribute to the Angels, 43. From Trilogy. New Directions. 1973.